Aquabats: This man drinks his milk with a curly straw. AZA is a retooled machine. After a few months of limbo, where FATTAH and MOHAMED tried to work as a duo, their group is back, and gauging from the turnout at the AMAZIGH CULTURAL FESTIVAL, their brand new bag is a hit. The upright bass of PETE NOVEMBRE adds a nice sonic background for the percussive work of both MAX BRUCE and NABIL RIGHI. Max was able to throw some Detroit into the mix with his understated bass drum work and Nabil's work on the RIQ and DOUMBEK adds another dimension of Saharan polyrhythm into the already well-developed sonic palate. Showing that the transition between lineups was a smooth process, both ALEX WORK and ANDY ZENCZAK mounted the stage for the perennial crowd favorite AISHA during the second set. Mohamed danced. Tea was served. Life was good. JOHN ELLIS is a country boy, whose hometown in North Carolina is even smaller than mine. But then again, CARY, my birthplace, is also known as a "Containment Area for Relocated Yankees." Damn Mechanical Engineering parents. Anyway, Ellis moved out and hooked up with ELLIS MARSALIS in NEW ORLEANS and has only occasionally returned home to the chicken ranch. John learned quite a few tricks from Marsalis and also got to borrow his sixth born, drummer JASON MARSALIS. Eschewing the "blow until red in the face" school of saxophone (a condition that was unfortunately in full effect during JANE BUNNETT'S show on the 18th; for all the arrangers and composers out there, please note that the Middle Eastern trumpet, the chromatic scale and the rumba do not a pleasant mixture make), Ellis is a great band leader who curtails his own sonic explorations the second they quit being collaborative. During the show, he spent much more time trading licks with pianist AARON GOLDBERG than wanking out on his own. That Country boy done good at the horn, y'all. According to her dad, JOHN, MARILYN MORRIS loves the AQUABATS. So she was pretty bummed out when she broke her arm last week while skating at DERBY PARK. Given her injuries, her parents wouldn't let her go to the Bats latest installment of their "superhero melodrama and Journey sing-along showcase" at the CATALYST last Wednesday the 20th. Though her dad was firm in his resolve not to let her in the mosh pit 48 hours after a major injury, he nevertheless wanted to make his daughter happier on her day of epic suckiness. Seizing the moment, John did what any sensible parent would do and rolled on down to the CAGE behind the Catalyst and asked to talk to the band. 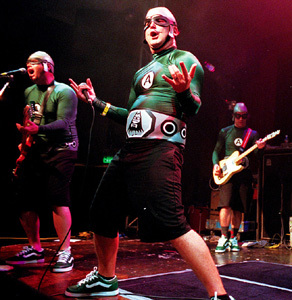 As the Aquabats travel with less security than the QUEENS OF THE STONE AGE, he was able to speak with several band members, and relayed Marilyn's pitiable condition. Acting as only true comic superheroes can, the Bats leapt into action and proceeded to Marilyn's house, where, backed up by her dad and younger brother, they played a set of three songs for their young and broken fan. After completing their act of Ruthian charity, they retired to Derby Park for their own skate session before returning to the Catalyst's stage. For their kindness the Bats all received some classic 1960s Mylar IGNORE ALIEN ORDERS stickers. Those should pimp out their decks quite nicely.